I mostly know e-Con Systems because of their camera modules, but the Indian company has also been manufacturing system-on-modules and development kits, and has just launched Propus development board based on their eSOMTK1 computer-on-module powered by Nvidia Tegra K1 quad core Cortex A15 processor, and including three camera interfaces with two 4-lane and one 1-line MIPI-CSI2 connectors. 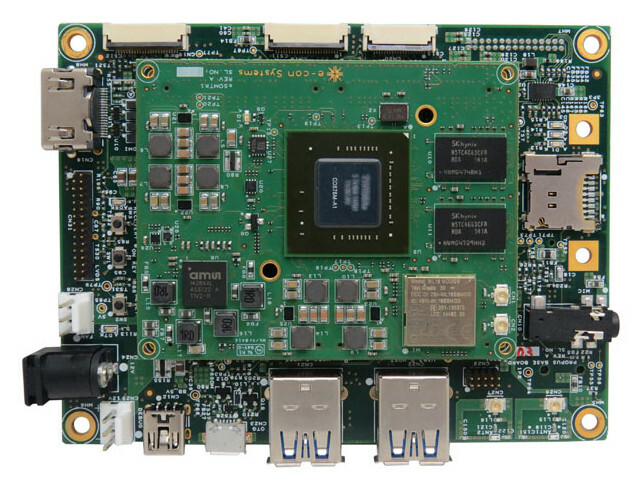 SoC – Nvidia Tegra K1 4-plus-1 ARM Cortex-A15 processor @ up to 2.3 GHz with 192-core Kepler GPU. The kit also includes a 12V power supply, and a USB to serial cable, with the board pre-installed with u-boot and Linux (Ubuntu), but the company provides both Linux and Android BSPs. 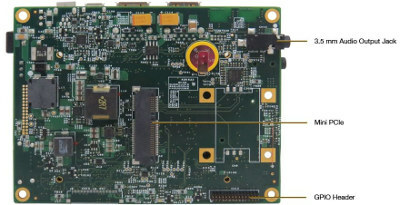 Add-on boards include 13MP or 4MP camera modules, and they used two 13MP camera to demo live video on the board. Propus development kit is currently available for $449, with the MIPI-CSI camera add-on boards sold for $149 each. 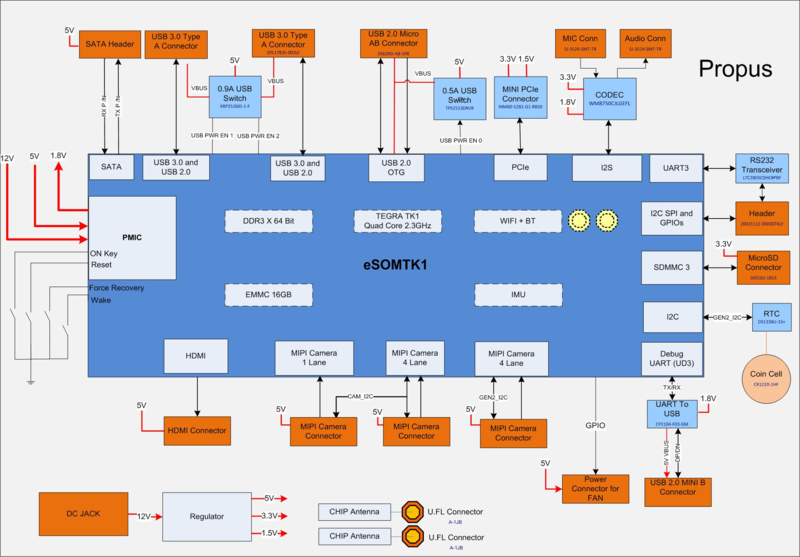 eSOMTK1 computer-on-module is currently selling in two configurations, including one with the wireless module and IMU, for $149 and $175 per unit for order of 1,000 modules or more, with custom configuration with up to 4GB RAM and 64GB storage available on request. Further details can be found on e-Con Systems’ Propus and eSOMTK1 SoM page. That’s a TK1 — the cheapest ever sold was in an Acer Chromebook 13 (~200 EUR for the entry config).